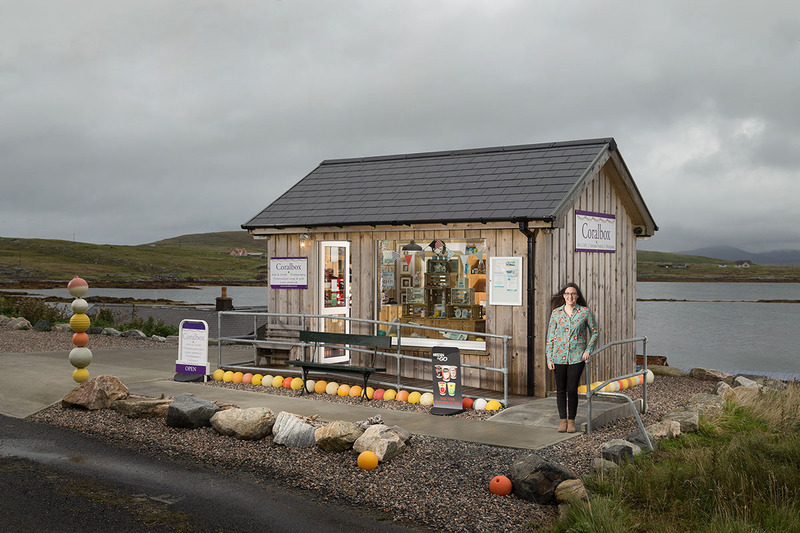 Eilidh owns and runs Coralbox, a small but perfectly formed gift shop on the Isle of Berneray – a small island in the Outer Hebrides, 3 miles wide by 2 miles long. Eilidh stocks a range of arts and crafts, jewellery, scented candles, personalised gifts, greetings cards and photography, including items made by Eilidh herself. Approximately half her stock is made locally. Befitting its location, many of the items on display have a nautical theme. Eilidh offers high quality products at affordable prices. Humble beginnings: Coralbox first opened it’s caravan door for business in 2016. 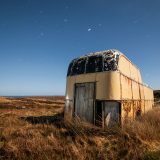 While Eilidh was working from the caravan, her dad – a builder by trade – started work on what would become Coralbox’s current home. 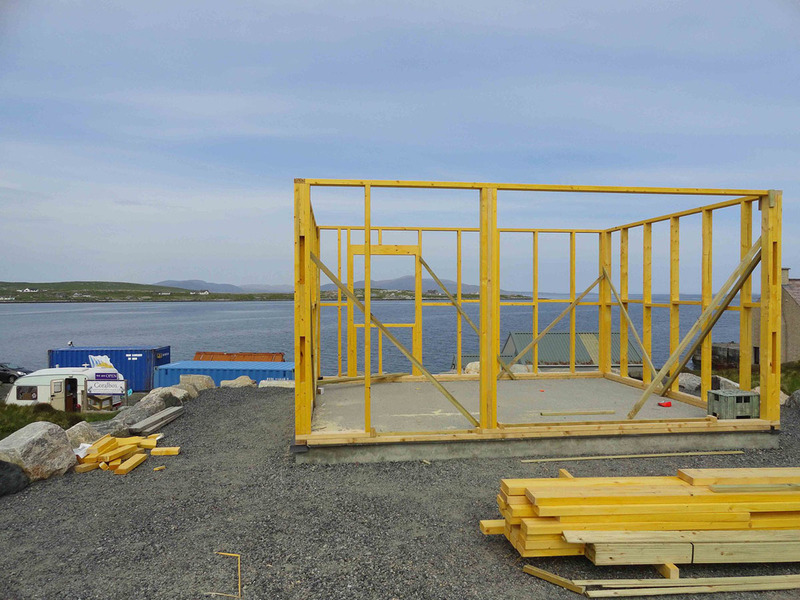 Eilidh sent me some photos taken during construction. 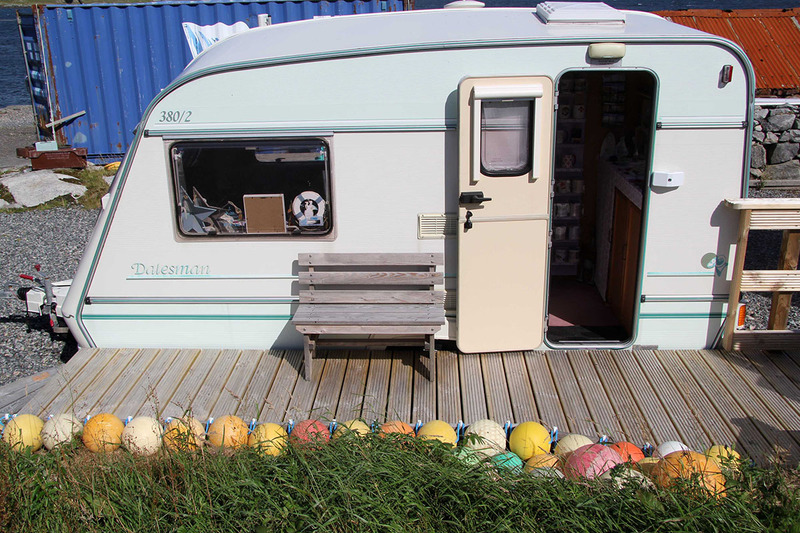 You can see it’s a sturdy little building – a big step up from the tiny Dalesman caravan! Coralbox Mk2 was built completely from scratch by Eilidh’s dad. Coralbox caravan (far left) and the new shop under construction (2016). Eilidh was born and brought up in Berneray. After leaving school she moved to Stornoway, before relocating to Aberdeen to study photography. While in Aberdeen she applied for a job in the city’s John Lewis department store. During the interview process she was asked a little about her background and where she was from. Some were amazed to hear Eilidh came from an island in the Outer Hebrides with a population of 130 people . “More people work in this shop than live on your island!”. Eilidh got the job. No doubt some of the retail experience she gained there assisted with the setting up and operation of Coralbox. 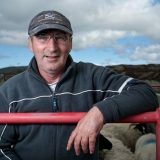 In 2017 Coralbox was nominated for the ‘Business Start Up’ category in the annual Scottish Rural Awards competition. The organisers look for “innovation, application and inspiration from new businesses”. Coralbox then made it to the final – along with nine other businesses from all over Scotland, including two distilleries, a whisky retailer and a restaurant. Eilidh attended the awards ceremony, held at Edinburgh’s 5 star visitor attraction, Dynamic Earth in March 2018. 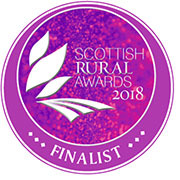 Although Coralbox didn’t take the win, it was a great accolade for the small shop from Berneray that started life in a caravan to make it to the final! 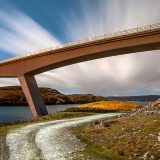 With Berneray now acting as the ferry port connecting the Uists to the Isle of Harris, many people pass through the island without taking time to explore what it has to offer. If you find yourself arriving at the ferry terminal with time to spare, it’s well worth making the short trip into the village. Before you reach Eilidh’s shop, you’ll pass the newly refurbished Berneray Shop and Bistro. Those wishing to dine there in the evening are well advised to book in advance due to the rave reviews they’ve been receiving since opening for business earlier this season. Accommodation-wise, Berneray’s Gatliff Hostel has long been a port of call for backpackers, cyclists and holidaymakers in general. The hostel has 21 beds which are available on a first come, first served basis i.e. no booking available. For those wishing to book their accommodation in advance, a brand new independent hostel opened during 2018. John’s Bunkhouse is suitable for individuals, families and groups of up to 8 people. Facilities include a drying room, bike shed and good disability access. There are also self-catering lets and B&Bs on the island. When you’re travelling on the ferry from Berneray to Harris (or vice-versa), keep an eye out for Eilidh’s uncle, Donald. 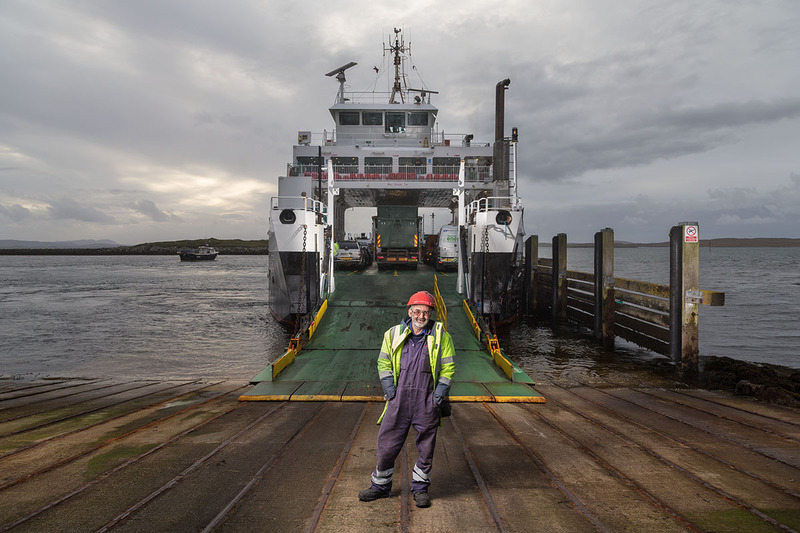 Here he is on the slipway in Leverburgh with the Calmac ferry MV Loch Portain in 2017. More about Donald here. The Berneray Giant: Angus Mòr MacAskill was born on the Isle of Berneray in 1825. He grew to 7ft 9ins tall and was well known for feats of strength such as lifting a ship’s anchor weighing 2,800 pounds (1,300 kg) to chest height, and an ability to carry barrels weighing over 350 pounds (160 kg) apiece under each arm or reputedly able to lift a hundredweight (50 kg) with two fingers and hold it at arms length for ten minutes. 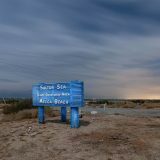 In 2009 the Thai tourist industry passed off a picture of West Beach on the Isle of Berneray as one of their own destinations, Kai Bae beach. The shot shows brilliant almost white sands, azure seas and distant mountains which may be similar to Thailand. The image was taken by John Kirriemuir and originally posted on the Isle of Berneray website. Berneray made world news in 1987 when it was revealed Prince Charles had visited the island to live a normal Berneray life as a crofter. 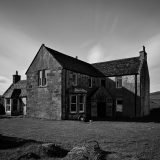 He lived and worked with a crofter for one week – as featured in the TV documentary, A Prince Among Islands. Don’t forget to visit Coralbox! 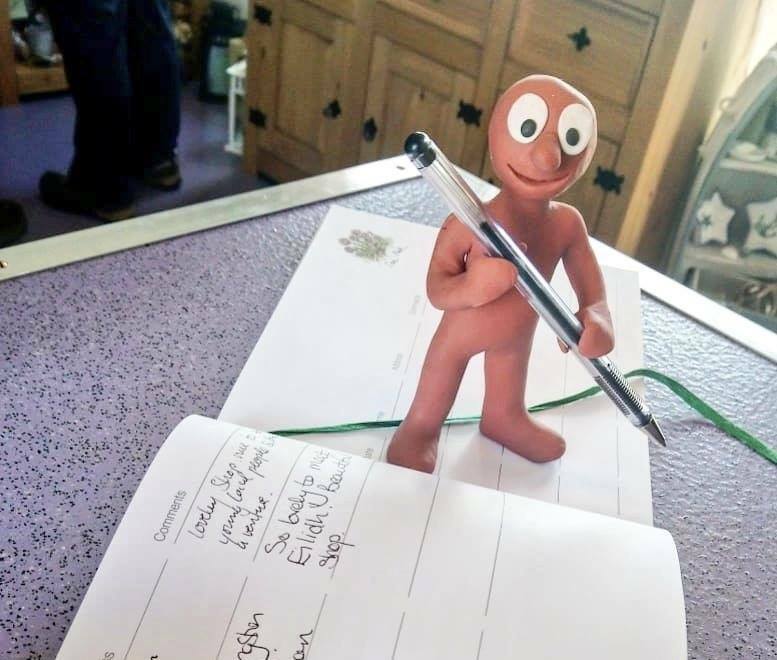 Morph did exactly that earlier this summer while travelling the length of the Outer Hebrides. Here he is signing the Coralbox Visitor Book.